and yet so much to do - it's crazy. The daily posts from sponsors of Sewing Summit have my head in a spin- like today's Opening Mixer with Craftsy (newly discovered by me and totally hooked) and other all time favs like Art Gallery, Olfa (despite my recent boo boo) and Pellon - which I've used more of lately with bag making... just to name a few. All this time to prep and I just now added my flickr/blog name to a name tag - it's not even new - I'm using the one I made at one of our first MQG meeting. My pre-cutting homework isn't done and I haven't even chosen fabric for my serger class. I want to pack my entire collection of buckets. I spent the last couple of days clothes shopping after a momentary freakout about what to where. Two new pair of shoes last night - out of control I tell you! Before I forget - I'm linking up to Q4 of FAL at Quilter in The Gap because despite the frenzy I know I really want to be part of that fun and finish. Keeping it real with four - upping my odds I figure. 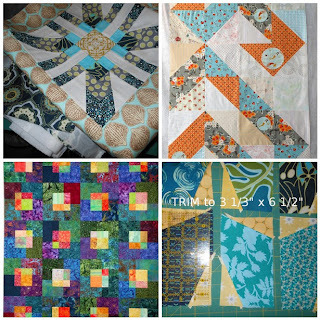 Tonight is my Quilt Guild meeting and tomorrow I get to sew with friends again making Swag Bags for our MQG Retreat. Fun Stuff. Hang in there - we'll be there before you know it!